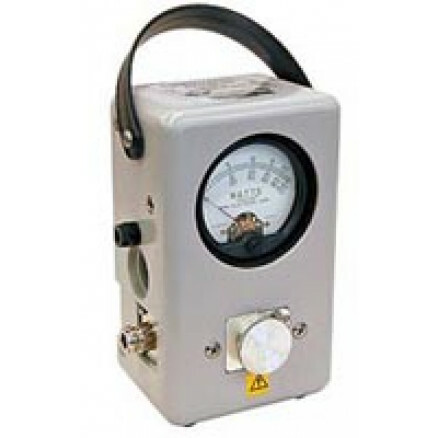 A field-proven portable, insertion-type instrument designed to measure both forward and reflected CW power in coaxial transmission lines under any load condition. With a full-scale accuracy of ± 5%, it accurately measures RF power with low added VSWR and insertion loss. QC (quick change) type connectors and a full range of plug-in elements provide a wide choice of frequency ranges and power levels giving the Model 43 amazing flexibility. Two extra elements can be stored in the housing, one on each side. The Model 43 is easy to use and simple to service in the field. Accurate CW field power measurement over 450 kHz to 2.7 GHz and 100 mW to 10 KW. 6-7/8" x 5-1/8" x 3-5/8"